This man knows me better than anyone, and he loves me anyway. I guess the same can be said the other way too. Sharing your life and becoming one with someone is bound to get complicated, but you do it together. While one is weak, hopefully the other is strong. Sometimes you are both weak and you just prop each other up and know it will get better because you have each other. The last few years have been the most challenging in our marriage, but we made it to seventeen. During the first ten years we were practically children. I feel like we’ve finally actually grown and matured over the last seven years. The biggest part has been finding God in our marriage and keeping Him at the center…no matter what. So here’s to another 17 years…and another…and so on. There’s more adventure to come. I love you Robert. Happy Anniversary. Posted in Christian, Inspirational, Reflection, Uncategorized and tagged anniversary, husbands and wives, life together, marriage, marriage isn't easy, true love. Bookmark the permalink. Today is a special day in my life. Fourteen years ago, I married my perfect match and best friend. Sure, neither one of us is perfect on our own, but we’re perfect for each other. I had never dreamed I would be married at twenty-two (I intended to be on my own until I was at least as old as I am now), but it all just fell into place and I knew it was meant to be. I’m not always easy to deal with and I’m closed off in my own head so much of the time, but Robert knows how to pull me out and when I need to just stay there. He’s seen me at my very worst, and fortunately, at my very best. We’ve shared happy momentous occasions, as well as the simplicity and joy of the small, quiet moments. We’ve seen what we thought was our dreams being crushed, and then discovered the dreams we were supposed to be following… and we learned to follow them together. We’ve sacrificed for each other and with each other, which has only grown us stronger. A marriage is work, but it’s worth it. I’m not sure who or what or where I would be without Robert, and I don’t want to know. I wouldn’t be the same me I’m proud to have become if he had not been by my side. I know God brought us together, and I thank Him for my loving, encouraging, supportive, silly, fun, and all-around wonderful husband. 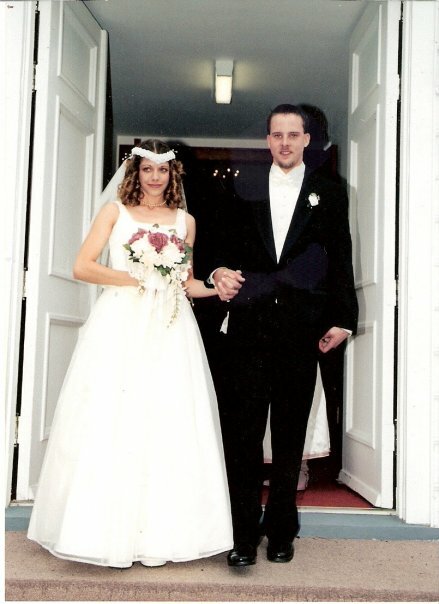 Fourteen years ago, we stood in a church, exchanged rings, and promised to be one together for the rest of our lives. Fourteen years ago, we danced to our song that still has the perfect lyrics for the way my husband makes me feel. Posted in Reflection, Uncategorized and tagged anniversary, I Could Not Ask for More, love, united as one. Bookmark the permalink.